The Indiana University Institute for Advanced Study is now accepting applications for its 2016 Summer Repository Research Fellowship. In partnership with repositories on the IU Bloomington campus and supported by the Office of the Vice Provost for Research, the program funds a short-term fellowship for a faculty member or community scholar to conduct in-depth research in the collections of one or more of our partner repositories. Applicants from Minority Serving Institutions, community colleges, and source communities are welcome. Preference will be given to applicants who are collaborating with Indiana University Bloomington faculty members. This initiative is intended to support research in the rich collections of the IU Bloomington campus and to build partnerships between scholars at and beyond IUB. The fellowship provides funding for travel costs, accommodation, per diem, and a two-week stipend. Please note: This fellowship is intended to support research in IU Bloomington’s unique collections; the application should focus on materials that cannot be accessed elsewhere. Summer 2016 partner repositories include the Archives of African American Music and Culture, the Archives of Traditional Music, the Black Film Center/Archive, the Glenn A. Black Laboratory of Archaeology, The IU Art Museum, the IU Herbarium, the IU Libraries, the IU Paleontology Collection, the Jerome Hall Law Library, the Mathers Museum of World Cultures, and the Sinor Research Institute for Inner Asian Studies Central Asian Archives. Applications are due by March 21, 2016. For application materials and additional information, please visit our website at http://ias.indiana.edu/fellows/summer-research-fellowship/ . For me, new light was just cast on a basket in the William C. Sturtevant Collection in the Department of Anthropology, National Museum of Natural History, Smithsonian Institution. 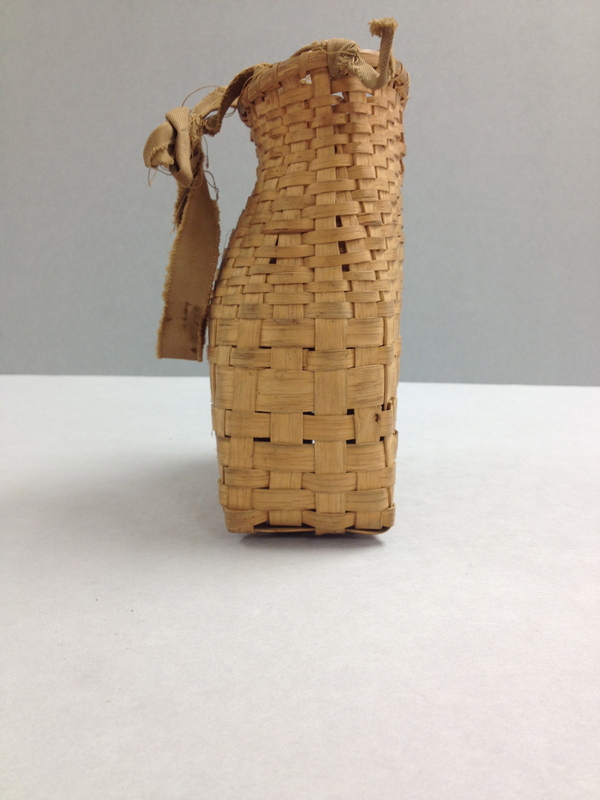 In the mail, I just received a slew of basketry books. This is a topic on which I need to get caught up for a number of interconnected purposes, including for the analysis and publication of the Mathers Museum of World Cultures basketry collections (especially the Eastern Cherokee baskets, which will be the focus of an exhibition that I will co-curate). 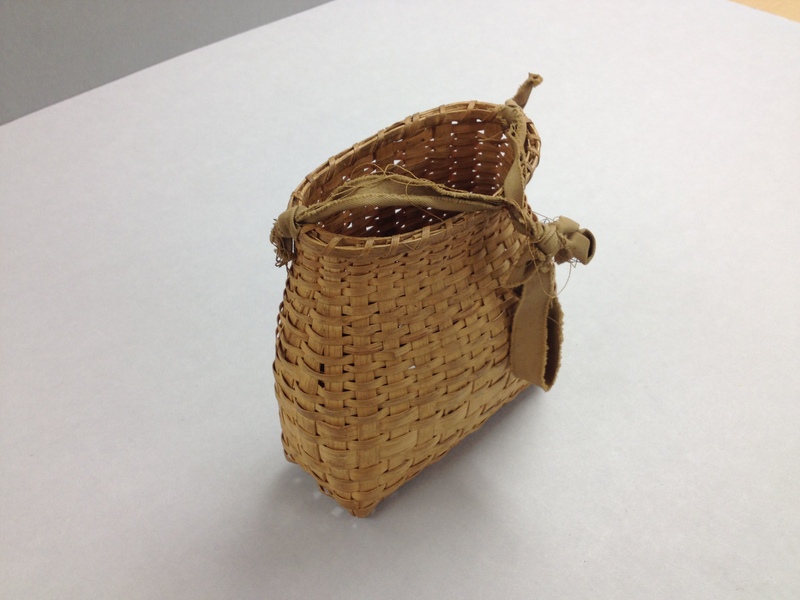 It shares the same, flat on one side, curved on the other, shape as the basket pictured by Irwin. In a photo on p. 157, Irwin photographed a older boy holding the basket under his right arm, thereby illustrating how the shape of both baskets facilitates the collecting of berries, nuts, etc. with both hands. 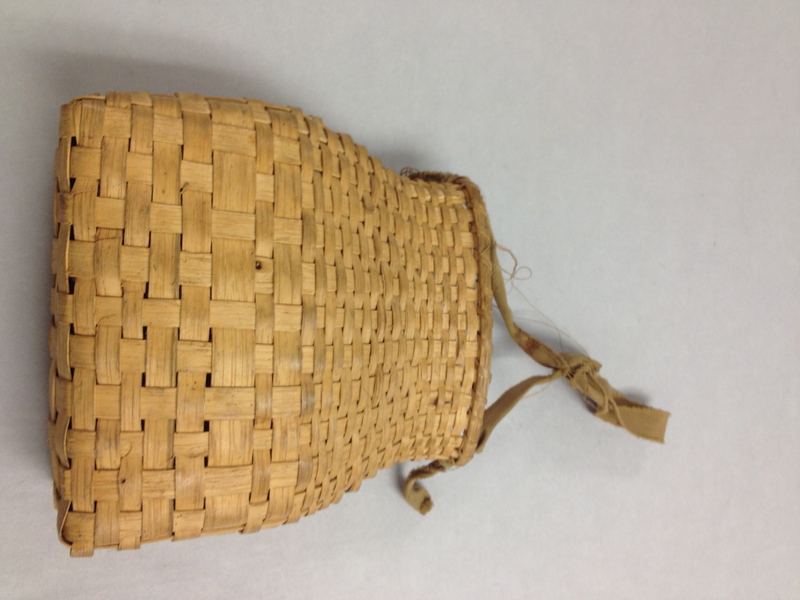 Prior to getting direct information from a Cherokee consultant who has made or used such a basket, this (that is, Irwin’s) is a much better account of this shape and its use that I had been speculating about. I would like to share news of the formation of an interest group in an area of interest that I know I share with many Shreds and Patches readers. The group is known as the “Digital Practices in History and Ethnography” Interest Group and it is a constituent interest group within the Research Data Alliance (RDA), an international initiative to facilitate the development of effective data practices, standards and infrastructure in particular research areas, and across research areas. The RDA aims to enhance capacity to archive, preserve, analyze and share data, and to foster collaboration across research communities. My DPHE colleagues and I invite you to join this interest group, and to participate in its online discussions. Biannual RDA meetings are an opportunity to meet face-to-face with others in our area, and with researchers in other areas. 2. Register in the top right hand corner of the site. 5. Answer the form question with a yes, and then you should be subscribed. The second RDA Plenary was held in Washington D.C. September 16-18, 2013. Our group discussed its mission and plan at a session on Wednesday afternoon, and circulated a list of discussion questions for on-going consideration by the group. We’ve now started a discussion thread about metadata in historical and ethnographic research. As detailed here, Garett Montanez and I will present tomorrow (2/13) at a project share (1 pm, eastern time) event focused on the Open Folklore project. The presentation will be online and is free and open to anyone interested. The DPHE group will be pursuing additional project-focused presentations, as well as open discussions of common interests and concerns. I will say more detailed things about the Mathers Museum of World Cultures during 2013 in later posts. Here I just want to flag a few happy curiosities. Today is the last day of 2013 and 2013 marked the 50th anniversary of the Mathers Museum of World Cultures. This fact made it an extra wonderful year to begin service as the museum’s Director. The exhibition Treasures of the Mathers Museum was the centerpiece of our celebratory activities and a new strategic plan was the fruit of our reflections on the past and our goal setting for the future. We have made good progress on our goals for the second half century, but that is for a future post. We were not alone among museums of ethnography, cultural history, and world cultures celebrating golden anniversaries in 2013. Joining us in such celebrations were the Fowler Museum at UCLA, the Wake Forest Museum of Anthropology, and the Cherokee Heritage Center. (2013 saw other notable 50th anniversaries in the broader museum world, including the 50th anniversary of the University of Wisconsin Milwaukee/Milwaukee Public Museum museum studies program.) Congratulations to all of the half century celebrants, especially to these museums in our corner of the field. 2013 was also a year for new directors among such museums. I am happy to be among them. My friend Candessa Tehee and I shared the experience of becoming directors during a 50th anniversary. Candessa is the new Executive Director of the Cherokee Heritage Center. Robert Preucel was named the new Director of the Haffenreffer Museum of Anthropology at Brown University and Patrick Lyons was named the new Director of the Arizona State Museum at the University of Arizona. The Cherokee Heritage Center was not the only Cherokee museum to get a new director, The Museum of the Cherokee Indian named James “Bo” Taylor as Executive Director. I am sure that I missed someone (please add them in the comments), but I want to wish all of these new directors well. It is an exciting time for our field and I look forward to seeing where we all collectively go during 2014. Many things have been happening lately–so many that keeping up with them here has been difficult. Many good things have gone unreported and some bad current events (global and national, not personal) have gone un-commented upon. I am pleased though to celebrate the conclusion of the 2013 Summer Institute in Museum Anthropology. I was invited to join the institute for its last week and a half and to participate in its concluding symposium at the National Museum of Natural History (NMNH) on the Mall in Washington. In the symposium, SIMA’s twelve graduate student participants presented the initial findings of their four-week research projects utilizing the (amazing) collections–both objects and archival materials–of the NMNH Department of Anthropology. 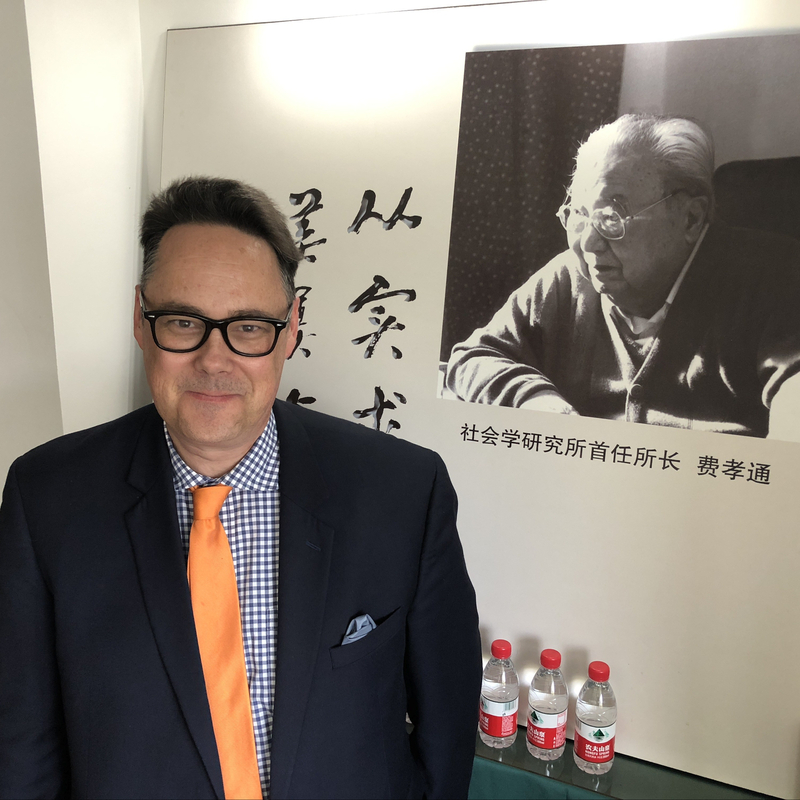 The students came to SIMA from many different graduate programs and backgrounds and possessed a diversity of historical, ethnographic, topical, and theoretical interests. They did wonderful work and I learned a lot from their studies and from their careful and compelling reporting. While they have further to go, of course, with their projects, I think that it is pretty exciting to hear the results of four intensive weeks of research as the concluding act of that same four week process. Quite remarkable. I am very appreciative of my continued association with this wonderful program. I am glad that I have been able to help it continue moving along so well. SIMA will happen again next summer. Details will be posted here on the SIMA website in the months ahead. The emergent Woodie Guthrie Center in Tulsa, Oklahoma (one of my favorite places) is seeking to fill two key positions: (1) Executive Director/Chief Curator and (2) Educator and Public Programs Manager. These are great opportunities in an exciting new venture to be built around the Woody Guthrie Archives . Find out about both the Director and Educator jobs on the Oklahoma Museum Association website. Today I had the privilege of beginning work as Director of the Mathers Museum of World Cultures. I will surely write about the work of the museum extensively in the months ahead. Here I just want to thank the museum’s staff for welcoming me and thank the Indiana University administration for giving me this exceptional opportunity to do the work that I love. I could single out countless museum objects, collections, colleagues, goals, or aspirations to write about here, but I will use this post to acknowledge the long and important service of my predecessor Geoffrey W. Conrad. The Mathers Museum celebrates its 50th anniversary this year, and Geoff led the museum for nearly 30 of those years. The museum accomplished a tremendous amount over those three decades and it is exciting to have a chance to collaborate in building upon the solid foundation that Geoff and the staff built over the span of his long and distinguished career leading the museum. The Center for Folklife and Cultural Heritage, Smithsonian Institution, is accepting applications and nominations for a Director. The Center for Folklife and Cultural Heritage is responsible for planning, developing, and managing programs which have as their major objectives the research, documentation, presentation and conservation of living traditional and grassroots folk cultures of the United States and of other countries. The director is responsible for the administrative direction and management of all Center program activities including the Smithsonian Folklife Festival, Smithsonian Folkways Recordings, Ralph Rinzler Folklife Archives and Collections, exhibitions, symposia, scholarly research, cultural heritage policy, educational projects and all media, as well as the participation of other Smithsonian museums and programs in national celebration events and National Mall events. The Director represents, at national and international levels, Smithsonian concerns relating to the understanding of the cultural representation of living heritage, as well as public sector folklore, and policies related to them. The Director will have a proven track record of leadership, management and fundraising skills to run a unique multi-disciplinary cultural organization. The successful applicant must have a degree in a relevant field, management level experience in public programming, and have earned a presence in the scholarly and/or cultural community. The Smithsonian offers a competitive salary commensurate with experience and a comprehensive benefit plan including a lucrative, fully vested retirement program with TIAA- CREF. For detailed information on the position, qualifications and application instructions, go to http://www.sihr.si.edu/jobs.cfm and scroll to position announcement EX-13-01. We are only accepting online applications for this position. For questions or additional information, contact Tom Lawrence, 202-633-6319 or lawrencet@si.edu. The Smithsonian Institution is an Equal Opportunity Employer. A perfect example of how scholarly research in folklore and anthropology can be made accessible and interesting for a wider audience is the Artisan Ancestors podcast produced and hosted by my friend and colleague Jon Kay. (Jon is, among other roles, the Director of Traditional Arts Indiana.) If you have not yet encountered the Artisan Ancestors show, I urge you to check it out. As Jon describes it, the focus of the show is on strategies for “researching creative lives and handmade things.” Jon does interviews with people involved in such work with the goals of encouraging and guiding newcomers to such studies and of expanding the horizons of those already deeply involved. Long adept in the skills of the public folklorist, Jon has mastered the podcast genre. He is a great interviewer and he knows how to do in interview with the needs of his audience and the requirements of the medium in mind. The production values are high but it is clear that he has worked out a system that gets good results without endless, expensive work. In his newest episode (#26) Jon interviews Dr. Candace Greene, another friend and the Director of the Summer Institute in Museum Anthropology (SIMA). The interview explores the purposes and goals of SIMA in a way that not only introduces this training program (for which I was a faculty member this past summer) but also encourages deeper understanding of the broader value of museum collections for research in social and cultural history. It is a great interview and listening to it will illustrate not only the value of the SIMA effort but also suggest the value of podcasting initiatives such as Artisan Ancestors. Kudos to Jon and Candace for their great job with this episode.